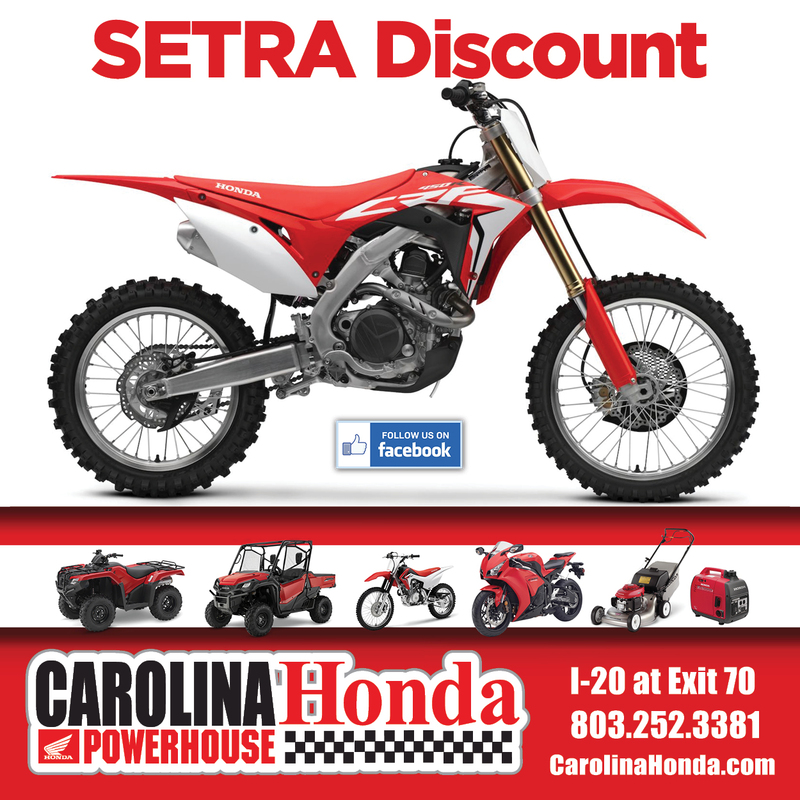 Round 3 of the SETRA hare scramble series took us to the GTR Complex in Gaston, SC. Weather leading up to the weekend was dreary. However, the cold and rainy weather did not keep riders away and they were rewarded with a great course. The sandy black soil of GTR does well with rain. By Sunday afternoon the conditions were perfect and the sun began to peek out. The course was a little over 11 miles. The opening half of the trail was fast and let riders hold it wide open. Around mile 4 the trail pace slows and dives into flowy single track. For the last mile the trail opened up leading up to the finish line. Rider turnout was great and made for close racing between multiple riders. Jonathan Johnson and Zack Hayes battled for the overall all day. On the last lap Zack made a pass early on to take the lead. However, Jonathan kept Zack close and re-took the lead by making a last minute pass in the s-turn just before the finish line. As one spectator reported it.. Jonathan stayed on the gas, flat tracking around the outside to re-take the lead. Jonathan and Zack finished 1st and 2nd in Pro with just seconds separating them. Similarly, Dalton Seal finished 3rd in the Pro class, but was closely followed by Chase Hayes in 4th. Only two seconds separated Dalton and Chase at the checkered flag. Pro class riders Brody Johnson and Tyler Silvia battled for 5th place and crossed the finish line eight seconds apart. Lastly, 250A rider Chad Lafollette finished 6th overall and edged out Open A rider, Patrick Jones by five seconds to win Overall A. 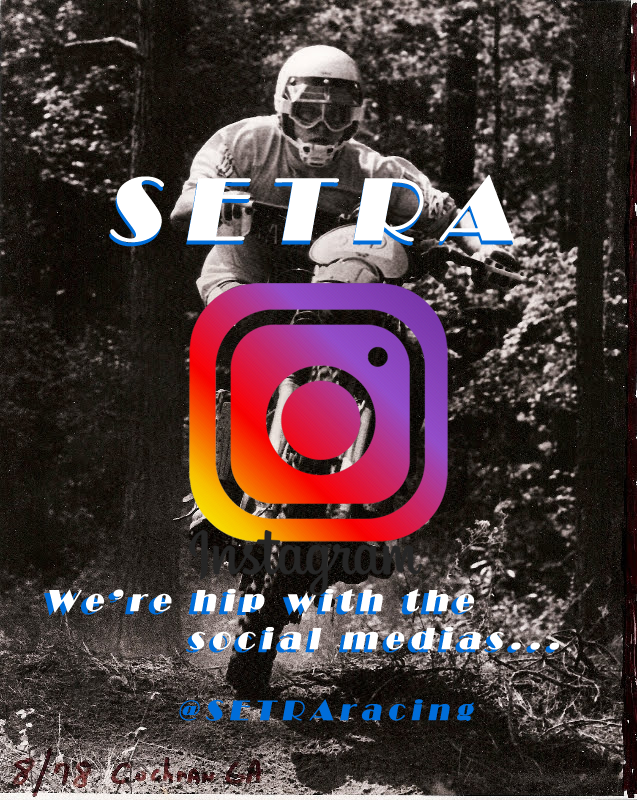 This past weekend marked the kick off of SETRA youth racing, with the Pee Wee class racing at 9:00 and Mini XC racing at 10:00! The Pee Wee class had a short but challenging loop, but they made it through with an occasional helping hand. Caleb Wood took the win followed by Rylan Roberts and Easton Harvey in 2nd and 3rd respectively. The Mini XC riders raced on the 6 mile single track loop and were flying through the woods! Andrew Segars took the overall win on his KTM in the 85 7-11 class. Ray Newton and Trent Wood from Junior Mini class finished 2nd and 3rd overall, respectively. Lastly, Malcolm Smith was the fastest 65 racer of the day, finishing 8th overall and 1st in the 65 10-11 class aboard his Yamaha. Thanks to all the riders and spectators who made it out this weeked! Also, thanks goes out to Columbia Enduro Riders who helped out with the race this weekend. Round 6 of the SETRA hare scramble series heads back to GTR for another race on January 16th. Robbie and the crew at GTR Complex did a great job this weekend! We look forward to heading back!